10 drops of lavender essential oil, and a half cup of baking soda. This combo draws out toxins, lowers stress-related hormones, balances pH levels. Drink 12-16 ounces of water during the hour before to be sure you’re hydrated. Fill tub with very warm water (body temperature for children). ‘Very warm’ should be comfortable. Between room temperature and scalding that makes you say Ahhhh when you sink into it. Add ingredients to the water while it is filling or just before you get in. Now sink down in the water, let out a happy sigh, and relax. Soak for 20 minutes. Take deep, slow breaths to increase oxygen flow and relax…without falling asleep. Rinse skin well when finished and voila! 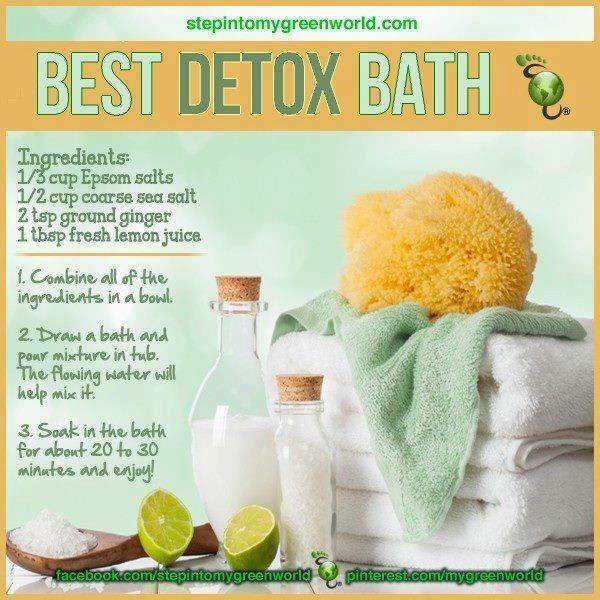 You should feel refreshed and relaxed. Drink another 8-16 ounces of water within 30 minutes to rehydrate and help flush out residual toxins. One beneficial detox method is using an infra-red sauna, particularly for slow metabolizers. It heats your tissues several inches deep, which can enhance your natural metabolic processes. It also enhances circulation and helps oxygenate your tissues. Your skin is another major organ of elimination, but many people do not sweat on a regular basis. This may be due to wearing synthetic or tight clothing that does not breathe. Sedentary living and sun damage also inactivate your skin. Repeated use of the sauna slowly restores skin elimination, which can help reduce your toxic load quite significantly. Steam baths, sweat lodges, vigorous exercise and hot tubs are other options, but not as effective. Your results will be best when saunas are part of an integrated program. You may want to add some natural, unprocessed salt to your diet to replace minerals lost through sweating. eg you may like to try it in a bath with heater on. ie sit while you cool down. Scroll down and read ~ How to take a sauna first. If you have a chronic condition, check with Dr and always have someone with you. and take a short sauna - once a week at first. Everyone today is exposed to heavy metals and toxic chemicals. Particularly for slow metabolizers, using an infrared sauna can be a very good method to detoxify. Its dry, warming energy is compatible with the body, heating skin tissues several inches deep. It helps enhance metabolic processes, & greater cellular energy production facilitates healing. so raising your body temperature helps heal infections quicker. Then sit with a heater on in the room- always have a drink with you. OR construct an excellent home sauna for under $75.00. A major organ of elimination, most people's skin is very inactive. not sweating enough. allowing toxic chemicals and metals to be removed. It's a daily habit that pays many dividends. To learn more about the health benefits of using saunas, please review the articles. Outside the sauna the EMF level should be below three. According to Dr. Clement, infrared saunas help release every type of toxic contamination you have in your body; most notable of which are mercury and lead. with nutritional supplements and fortified foods. "Most supplements are made out of petrochemicals, coal tar, turpentine—eg Vitamin E "
either out of oyster shells that are totally indigestible, or chalk, which is a known carcinogen! … All that calcium… that your body cannot process, lodges inside of your muscles. A lot of these muscular diseases today, and pain, like fibromyalgia can be due to this." Other contaminants being eliminated include drugs and environmental chemicals. 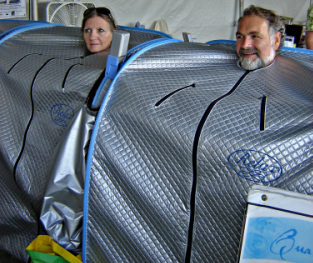 "What's interesting is you'll actually detoxify more, with the infrared sauna," he says. "And infrared saunas, are far less expensive than the normal saunas today. Heating of the tissues enhances metabolic processes. Greater cellular energy production facilitates healing. Viruses, tumors and toxin-laden cells are weaker than normal cells. They tolerate heat poorly. Raising the body temperature causes infections to heal more quickly. Hyperthermia or fever therapy help combat infections and even cancer. Our bodies develop fever when ill to enhance metabolism and help kill germs. Saunas enhance circulation and oxygenate the tissues. They open the nasal passages and assist the sinuses to drain. A major eliminative organ, most people"s skin is very inactive. Many do not sweat. This may be due to synthetic or tight clothing that does not breathe. Sedentary living and sun damage also inactivate the skin. Hundreds of chemicals affect the skin from lotions, soaps, creams and deodorants. Other are cleaning solvents, detergent residues and chemicals from bathing water. Repeated use of the sauna slowly restores skin elimination. Toxic chemicals and metals can be removed faster than with any other method. It is a daily habit that pays many dividends. Steam baths, sweat lodges, vigorous exercise and hot tubs are more extreme and less effective. Remain in the sauna no longer than 30 minutes at a time. Rest lying or sitting for 10 minutes afterwards. This allows time to eliminate dead cells and other debris. Drink mineralized water before and after the sauna. Make sure the bowels move regularly, as sauna therapy will increase elimination. Use the sauna with supervision if you have a chronic condition. If debilitated or very heat-sensitive, begin with a shorter time. The presence of an attendant or friend is also most helpful. should consult a health professional. Slow metabolizers may use the sauna up to twice a day. Upon arising and at bedtime are excellent if time permits. Evening is probably best if you use it once a day. If ill, however, the morning is better when energy levels are higher. Less often is also acceptable if beginning or to maintain your health. If you are very debilitated, begin with once a week. Work up to daily use as you feel able. Fast metabolizers should use the sauna once or twice a week. Drink two glasses of mineralized water before entering a sauna. Add juice or minerals to your water if it is mineral-free. The infrared sauna will not work through clothing. Men, position yourselves so the testicles are not directly exposed to infrared energy. Pass the time meditating or review your day. Use a small towel to wipe off the sweat. Not recommended are talking or working in the sauna. Ventilate the sauna whenever you use it. This may be built into the design. This avoids breathing toxic gases. If you use a bathroom or closet, leave the door slightly ajar. Finishing Up. Remain in the sauna no more than 30 minutes. Use your judgement regarding the time. The temperature should not exceed 110. Some days you will sweat more than others. When finished, take a shower, warm or cool but not hot. Avoid using soap as you will be clean. Soap leaves a film and clogs the pores. Wash off the sweat with skin brush or loofa. Brush all over, even face and hair- enhances the cleansing effect. Shampoo and conditioner use only if needed. Most contain chemicals toxic to the body. Also skip most lotions and creams. These also contain harmful chemicals. Use coconut oil to moisturise the skin. After the sauna drink a glass of water. Sit or lie down for at least 10 minutes. These simple steps allow your body to reap the full benefit of the sauna experience. As you become healthier, you will sweat more easily. Also, to heat up the sauna will take longer. The body dissipates heat more efficiently and fewer cellular toxins are there to be removed.